That's how much we would be paying at the pump today if the dollar hadn't weakened from parity with the Euro in late 2002. As it is, we're only paying an average of €1.15 according to AA Roadwatch. In the chart I show the course of a barrel of Brent Crude (the most relevant measure for Ireland, for now): in both US Dollars (as it is currently traded) and in Euro. 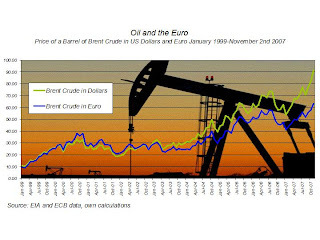 The historical data for oil prices comes from the Energy Information Administration, and the exchange rate data from the European Central Bank. Data for November (as of last week) is from the BBC. For an even longer answer check out the papers presented at the conference on 'Oil and Money' last week in London. In particular, the presentation by Sadad Ibrahim Al Husseini, former EVP at Saudi Aramco. The bottom line: when it becomes easier to print money than to find oil then there is only one direction that the price is going to go in the long term - whether measured in dollars or euro.